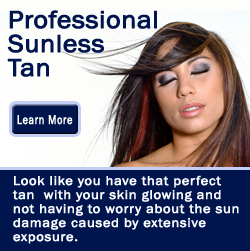 Dr. Prasad and our staff believe very strongly in sun protection. Besides from the obvious risks for skin cancer, harsh sun exposure is one of the major causes for our appearance aging prematurely. This is why we have embraced airbrush body bronzing. This extremely safe and easy procedure is performed by a highly experienced RN in our medi-spa. The results are amazing, you will look like you have that perfect tan with your skin glowing and not having to worry about the sun damage caused by extensive exposure.Achieve that glow in minutes with PRASAD’s Sunless Tanning Solution and the expertly trained professionals to give you the look you want. PRASAD Sunless Tanning Solution is a formulated solution, that when sprayed on a tanner’s skin, can give the tanner a “just off the beach” look without the harmful UV exposure. Read more below about the dangers of tanning beds from a study published in: Addiction Biology. Dallas — Frequent tanning bed users may have a neurological reward-and-reinforcement trigger similar to that seen in drug or alcohol abusers, Medical News Today reports. Researchers from UT Southwestern Medical Center had participants use tanning beds on two separate occasions. On one occasion they were exposed to ultraviolet radiation; on the other, special filters blocked exposure. Participants were not told in which session they received the real or the filtered UV exposure. Before and after each session, participants were asked to rate their desire to tan and also were administered a compound that allowed researchers to measure brain blood flow during tanning. Investigators found that participants’ brain activity and corresponding blood flow were similar to what has been observed in people addicted to drugs or alcohol. Dr. Adinoff says the next step is to create technology to further study brain changes among frequent tanners. The study was published online in Addiction Biology.